Two classic performances, one with the composer�s imprimatur as executant. 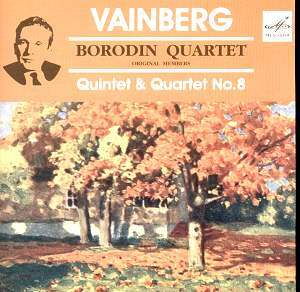 The wartime Piano Quintet is a fascinating work written in five movements that bears some similarity with Shostakovich�s Piano Trio. Completed in 1944 it was first performed by Gilels and the Quartet of the Bolshoi Theatre. The melancholy lyricism of the first movement fuses with jagged march themes which in turn become more and more garrulous and menacing. By the Allegretto increasing motor rhythms and oily lines for solo strings and heavy rhythmic attacks � strong independent piano part, powerful unison strings � bring hints of baroque procedure and a grave conclusion. It�s a quintet that really covers all emotive states, from the almost manic first violin of the Presto to the stern passacaglia-like fourth movement Largo. Here the long, and limpidly sung piano is flecked with great gravity, a memorable movement. To my ears the finale has a weird Scotch snap to it � a scotch reel fugato if one can imagine it in the context of a Weinberg quintet and there are also moments of almost hallucinatory boogie; I couldn�t quite believe it. The ghostly mists gradually descend though and we end with fugitive and ambiguous quiet. It�s an unsettling work, kaleidoscopic, deeply rooted in Shostakovich of course but still sounding intensely personal. Melodiya�s presentation is attractive and there are multi-lingual notes. There�s some audible tape hiss at moments in the 1963 recording of the Quintet though the earlier 1961 Quartet fares better in this respect. In any case it�s a very minor question and won�t at all impede your listening. These are two big, powerful and comprehensively impressive musical statements.